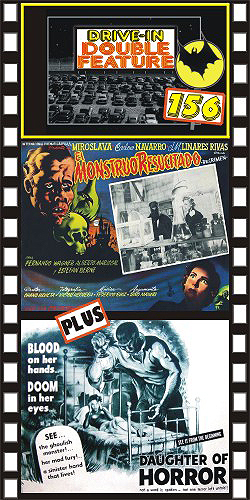 THE MONSTROUS DR. CRIMEN (1953) Jose Maria Linares-Rivas, Miroslava, Carlos Nivarro, Fernando Wagnerl. A classic South-of-the-Border horror film that looks like a Universal film of the ‘40s. It’s got a mad scientist; a beautiful dame who falls into his evil clutches; a ghoulish assistant; a Strickfadden-style lab scene; a man-made monster; a crumbling cemetery; a gothic castle filled with wax statues of the mad doctor’s previous victims, and to top it off, the film boasts a terrific music score, not unlike H. J. Salter's scores for Universal. The finale features a crazed-monster-vs.-mad scientist-showdown. Great fun throughout! With English subtitles. 35mm. PLUS: DAUGHTER OF HORROR (1955) Adrienne Barrett, Bruno VeSota, Angelo Rossitto, Narr. by Ed McMahon. A bizarre film about a wandering girl who falls into a strange series of events that culminate with her sawing off the hand of the man she has murdered. The film has virtually no dialogue and is done in a wandering, dream-like style. A cult favorite.